I was unaware there was vacant race seats when I asked Lucasinio to join SCR. If he wants to jump ship and take a race seat, that would be his choice, and I certainly wouldn't stand in the way of that as it certainly is in the best interests of the league. > season 12 if needs be. That’s kinda why I suggested the list of open seats be routed around so that anyone joining can see what is available. With that in mind I do know that we can add Mac to the list because I left a race seat to setup Christel. Feel free to quote this post and add vacant race seats to it. Then new people have an immediate idea of where available seats are. > idea of where available seats are. > > season 12 if needs be. > > > season 12 if needs be. Duly noted but I wonder how many new people would actually look at the wiki for this kind of information. I didn’t know it was on there and I’m a regular participant. It’s not to undermine the wiki it’s simply to keep the information front and center for the good of the league. Mal, could this be stickied, please? I did the overview based on the information of the wiki and some common sense, some marked as questionable with a question mark. But at least it's something to plan with and to give a better starting point for newcomers. I wonder if we are almost back at a point where we have to knock the testers league on the head for a bit and/or let team bosses race again. We are at an all time low at the moment. Letting team owners race (with restrictions) might be inevitable as a last resort. But first, let's see if we get a few more drivers into the league. And of course, all team owners with signed test drivers are encouraged to loan them to teams on the hunt for race drivers. However, as things are at the moment, this won't solve the issue entirely. When we know more specifically with how many drivers we'll start the season, we can consider dropping the tester league for some kind of compensation. But we also shouldn't forget that coverage time is one big factor to attract new drivers. For next season, it would be prudent for us to concentrate on filling all the race seats first. To this end, maybe we should think about releasing all test drivers from their teams to sign for others. If theres a driver space going, I'll swap teams if possible to Christel racing, if thats fine for everyone. As for the test series, my vote is to keep it. I want "me" out there on track, for both self interest and future possibilities of returning to race driving duties. Even if every team owner tests, and we take race driver to fill the 2nd seat, done. Currently there are only 4 test drivers for S12 and 5 race seats vacant if the sticky post is up to date, which I hardly believe as Maikel didn't announce yet Snake's line-up. 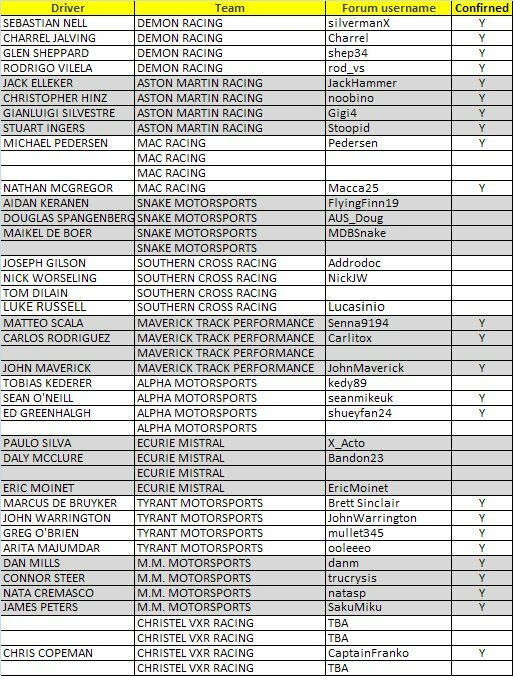 My current take on the Season 12 team/driver lineups, in no particular order... No official team or driver order, just names and Y for previously confirmed signings..... Non confirmed are left over from S11 driver/team lineups. My drivers (and myself) are confirmed since august last year. You can add them (and me) to the confirmed list. > are left over from S11 driver/team lineups. That's awesome! Exactly the kind of thing we need. Cheers Greg. Get PM'ing me guys. If it helps - the Christel name has a rich legacy of bringing through youth drivers and making them stalwarts in the series. Three of our graduates include the hugely underrated Michael Pedersen, AMR sensation Jack Elleker and Mr Connor "cannot" Steer himself. Mr Greg 'O Brien and Dan Thomas also had spells in the Christel garage I believe.